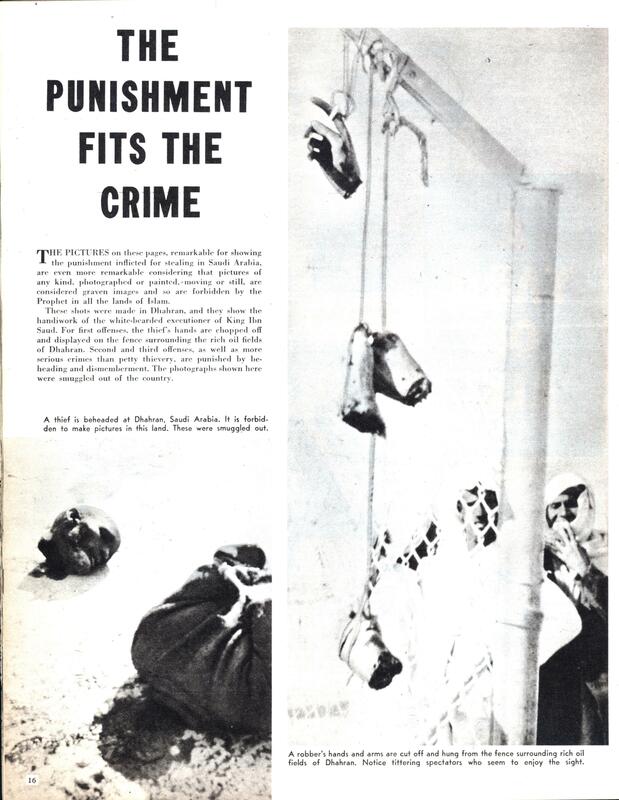 THE PICTURES on these pages, remarkable for showing the punishment inflicted for stealing in Saudi Arabia, are even more remarkable considering that pictures of any kind, photographed or painted, moving or still, are considered graven images and so arc forbidden by the Prophet in all the lands of Islam. These shots were made in Dhahran, and they show the handiwork of the white-bearded executioner of King Ibn Saud. For first offenses, the thief’s hands are chopped off and displayed on the fence surrounding the rich oil fields of Dhahran. Second and third offenses, as well as more serious crimes than petty thievery, are punished by beheading and dismemberment. Tlie photographs shown here were smuggled out of the country. other”), but this doesn’t stop American politicians who boast of their Christianity also boasting of their support for harsh punishments and a pitiless impulse to revenge. Stephen: name me ONE SINGLE American politician, Christian, Jew, Muslim, or athiest, who advocates cutting off hands as a punishment for stealing, or public dismemberment and beheadings. This isn’t a political site, it’s just a fun look at retro tech and culture. So don’t you DARE even try to draw a parallel between the barbarous Middle East of 1950 (or today — they haven’t changed) and America or Americans. There IS no parallel. I don’t want to read that crap here — you can spout your vitriol countless other places.